Well...yeah. Cameron is SO easy, I swear. All you have to do to get his approval, it would seem, is leave a boyband. It really does appear to be that simple. He always seems so utterly impressed by this amazing act that you will be in his good books forever. Abs was 'criminally underrated' after we as Australians let one of the 'singles of the year' in What You Got flop. Justin went solo, and unleashed a year long Love-Feast within the pages of HiT. He made 'pop music as vital as oxygen', was 'the only popstar worth bothering with', ('why doesn't everyone else just give up? '), and apparently ALERTED Nsync fans that they 'weren't in Kansas' anymore, following the release of Justified. Robbie become the ultimate 5 Star Hero. The 'World's Greatest Popstar'. Though Cam loved him years before the rest of us, 'Australia' 'finally found some taste' when Better Man went top 20 in 2001. Cam even thought the Swing album was top stuff. 5 Stars for 'I Will Talk And Hollywood Will Listen'? - Yes thanks! The common thing with all these examples, was that there was always a vibe coming off the pages of HiT of Cameron being...IMPRESSED. Really, really impressed. In awe. Amazed. Shocked and delighted. I don't know quite what it is with him and ex-boyband members. But he just loves them. And yet. YET. I never thought I'd see the day a Westlifer was on the cover of HiT. The band who sent the world to 'hell in a handbasket'? The NO STAR wonders? The worst band ever?? Apparently this has all been forgiven though. Now that Brian is an amazing solo star, he is Cameron's new most favourite popstar ever. A cover story, feature article, great single review - he got the full treatment. 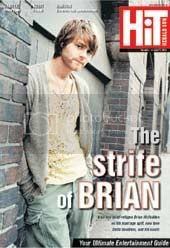 It was Extreme Brian McFadden Appreciation Mania. Did you know that his lyrics are 'painfully honest'? That his new single is a 'great ballad'? That he DEFINITELY DID NOT LEAVE HIS WIFE FOR DELTA THEY WERE ALREADY BROKEN UP, HAVE I ALREADY MENTIONED THAT 3 TIMES IN ONE PARAGRAPH WELL YOU CAN NEVER HEAR IT ENOUGH. The last part was probably just as much for his sweetheart Delta's benefit, but it was also because Cam has caught the Brian love in a severe way. I mean, Cameron, really. You ARE a touch overexcitable. It's ok, I am too. But at least my views are contained to a VERY small audience. Oh, also - Scissor Sisters were in the 'Hot' section. I know, I'm shocked by this too. What next, KYLIE ON THE COVER?